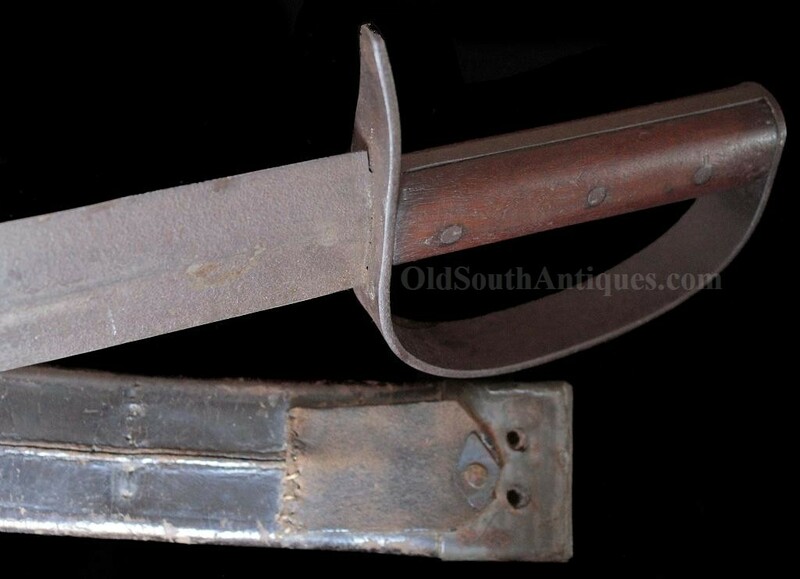 For more than half a century the maker of the D-Guard knife shown here has been misidentified as a product of Louis Froelich’s CSA Armory in Kenansville, North Carolina. How this misidentification came to be makes no difference; how it has been properly identified as a Burger/Boyle & Gamble, Richmond, Virginia product does. The story begins when I purchased a bowie knife that had a grip like those found on Burger & Brothers’ knives, and a blade like the very distinctive Froelich identified knife with a triangular shaped flat on each side at the ricasso. It was also interesting to note that it was in its original, tin scabbard with the design characteristics of the Boyle & Gamble knives. This opened my eyes to the possibility that the knives had been misidentified. Following extensive research, I found that through this last half century, no example of a knife commonly called a "Kenansville” has been discovered which had a Louis Froelich/CSA Armory maker mark. Nor have any been discovered bearing the Roman Numerals so often found on Froelich products. After canvasing the old time Kenansville site relic hunters, I found that no one had ever found any part of a "Kenansville” knife in the vicinity. Over a period of time, I discovered a Burger Brothers marked example of the distinctive knife known as a "Kenansville Clip Point D Guard”. I also found a Boyle and Gamble marked example without its scabbard, and I found a Boyle & Gamble marked example with the original tin scabbard. The tin scabbard exhibited the traits of the known Boyle & Gamble tin scabbards. In the National Archive files I found receipts for hundreds of "Artillery Knives” made by Burger/Boyle & Gamble. I think this name was to distinguish them from the small camp knives made by Boyle & Gamble. In my own mind, the above information was enough to convince me that Burger/Boyle & Gamble made these knives. However, changing 50 years of public opinion cannot be undertaken lightly so I did not disclose my findings and kept looking for more confirmation. That confirmation came in the form of a knife captured from Samuel Wilson of the Goochland Light Artillery at the Battle of Carnifex Ferry. On September 10, 1861 the battle was fought throughout the afternoon. The Yanks were repulsed at dark, and Confederate forces withdrew during the night. The Yankees advanced the following morning to claim the camp. At the time of the battle, Samuel Wilson was in Captain Guy’s Goochland Light Artillery. I find no record of him having been captured in the battle, so the knife must have been left in the camp during the retreat and the label identifying its time (9/10/61) and location of capture put on it by the captor. John McAden’s Louis Froelich Arms Maker to the Confederacy reports the establishment of Froelich’s manufactory in September of 1861. However, Wilson’s knife had been delivered, issued, and captured by the time Froelich was in operation. This leaves no doubt that the "Kenansville” knives, cannot have been made at Kenansville. Prior to the War Between the States, Edwin Boyle and the Burger Brothers were in the saw manufactory business. When the Northern states invaded Virginia, Mr. Boyle joined with a P. Gamble and began the manufacture of various types of edged weapons, including knives and swords for private purchase and for the Confederate Government. The Burger Brothers had a much smaller production, but they too made swords and knives. I would like to think that the Burgers and Mr. Boyle were motivated by patriotism; but I am sure, as an astute businessman he could see that there was going to be a bigger demand for swords than saws. Most of Burger Brother’s and Boyle & Gamble’s products are unmarked; fortunately they did mark enough of each type of weapon for the modern collector to readily identify their unmarked products. The massive twenty-one inch D-Guard knife shown here is one of their products, in its original scabbard. Notice that it has the three iron rivets like other known Burger knives. Part of the blade has a heavy surface rust, not pitted, but enough to feel rough to the touch. Though you can hardly see them, even in person, there are a few places along the edge that must have been slightly raised from striking something which have been lightly hit with a file to knock them down. These appear as darker areas. For example, look at the left side of the third picture from the top and you will see two slightly darker areas about half way down, and one at the top left; this is how the areas described appear. As mentioned, it is in its original scabbard. The scabbard is strong and the knife fits it well, but it is missing its tin toe. The original hanger style belt loop was a weak link and it has broken and the soldier riveted and sewed on a new belt loop which remains strong.